Have you ever thought that the colours of what you feed on could be important; what significance do these colours really have for you? Now, there are seven colours that make up the ‘spectrum’ or colours of the rainbow. When I was a small boy in the village we heard, and even sometimes on our own made up stories of all sorts. 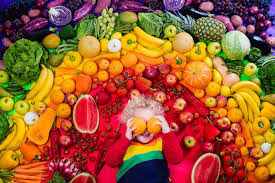 Nature has in a way built in all these colours into the foods, especially fruits and vegetables that we need to eat for optimum health.